Just a quickie to say there is only a few days left before the discounted price for the Just4keepers Goalkeeper Camps goes up to the full price. Please goto www.goalkeepercamps.co.uk for more information. This is just a quick note from all the J4K coaches to wish you all a very HAPPY NEW YEAR! Just4keepers helped over 50 young keepers achieve their dream of getting a trial or a contract at a professional football club. One ex Just4keepers student (Matty Edwards) made his professional debut for Rochdale. Just4keepers does not count our success on our students getting a professional contract. Even though this is a wonderful achievement J4K gets just as much satisfaction when we hear that a young keeper who came to us with no confidence has eventually gone from a team’s B team, to the A team or they have finally broken into the school team. For J4K, this is why we love goalkeeper coaching so much because we are here to BUILD CONFIDENCE IN CHILDREN and or our older students! AND EVERY WEEK, J4K helps OVER 5000 goalkeepers develop and grow their self esteem, self belief and self confidence. In a period were there are loads of other coaching schools maybe not coaching for the correct reasons, J4K is proud that we run our coaching schools for the right reasons... the children! We are also proud to say that over the past 4 years, we have managed to keep our coaching fees to about £5 per session, being nearly 40%-60% cheaper than 95% of other goalkeeper training schools. This has been very difficult to do, particularly in this financial climate but we have managed to sustain this by remembering we serve others, not ourselves! With our coaching fees arguably the fairest in the UK, and with the Just4keepers Coaches now boasting OVER 500 professional playing and coaching years between them, and OVER a MILLION HOURS played in goal professionally and Internationally, we believe 2011 will be our best year yet fr helping young goalkeepers! Just4keepers adds another Ex International Goalkeeper to our coaching ranks! Paul started his career at Wrexham FC where he progressed through the youth system before being offered a full time contract. He made his first team debut in 2002 against Everton playing against a certain Wayne Rooney. Paul has represented his country at every level and during his time at Wrexham was part of the promotion winning side in 2002, he has also won the Welsh Premier Cup, actually twice, in 2002 and again in 2003. After leaving Wrexham Paul gained European experience playing in the UEFA cup and the famous Champions league. After several successful years playing in the Welsh premier league for the likes of Rhyl and TNS, Paul then signed for Cammell Lairds where he helped them win promotion to the Unibond Premier League in 2008. In 2009 Paul moved back to his hometown club, Llandudno and in his first season he helped them retain the League cup and just missed out on promotion to the Welsh Premier League. Along with playing Paul is the head goalkeeper coach at both Wrexham and Llandudno Academy's. He has over 250 professional League and non League appearances and has been fortunate to work with some of the best goalkeepers (And Goalkeeper coaches in the world) such as Neville Southall, Andy Dibble, Eddie Negiveski, Paul Jones, Mark Crossley, Darren Ward, Grenville Millington, Fred Barber, Mark Morris and Michael Oaks. Now Paul wants to pass on his experience and knowledge to young keepers throughout North Wales to help them improve their game. Goalkeepers, DO NOT train on Frozen pitches!!! Its has come to my attention through the MANY emails I get each day that young goalkeepers are getting forced to train on frozen pitches. Keepers, PLEASE DO NOT train on this type of surface because it is the most dangerous playing surface a goalkeeper can train on. Parents, if your son or daughter is getting made to train on frozen pitches, you have to use common sense and refuse to let your child train. I have seen sooooooooooo many injuries happen because of frozen grounds, so please do not train. Whether its your local soccer club or you attend a goalkeeping schoolss in your area, DO NOT, I repeat DO NOT train on this hard, slippery and VERY dangerous surface. Uncle Ray has now warned you, so please listen! How would you like FREE Goalkeeper Training in Cardiff ran by Just4keepers which is now the biggest Goalkeeping coaching schools in the world, currently training OVER 5000 goalies every week! Just4keepers Goalkeeper Coaching schools has helped OVER 250 budding young goalkeepers get to professional clubs. And with prices starting at just £5 per session, why pay the silly high prices elsewhere? Do you want professional goalkeeper gloves at special xmas prices? 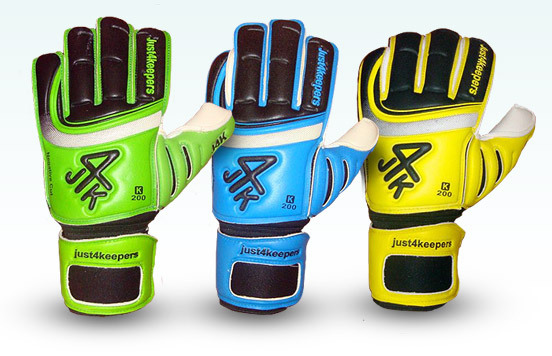 If yes, please goto the Goalkeeper Gloves Special offer deal at the J4K site. I have hidden these deals under the 'Must by for Goalkeeper' link. Be quick, as J4k will be pulling this deal shortly! I hope this helps with finances, especially this time of year! Would you like to receive FREE Goalkeeper Coaching in Newcastleby Just4keepers which is now the biggest Goalkeeping coaching schools Internationally, now operating in 4 CONTINENTS!!! J4K has helped OVER 250 budding goalkeepers get to professional clubs. And with prices starting at just £5 per hour, why pay the silly high prices elsewhere? After the wonderful testimony below sent by a parent regarding J4K Coach Jim Provett, if you want a free goalkeeper training in Hartlepool or surrounding area, please email Jimmy at jim.provett@just4keepers.co.uk. You will not be disappointed you went to Jimmy for your professional goalkeeper coaching. With many Goalkeeper Training Schools now popping up everywhere with a focus of just wanting to coach the best of the best, which is wrong in my opinion... when you see the testimony below from a parent of a disabled child attending J4k, it make me so so proud of what J4K is achieving for children. Just4keepers is here for children of all ages and abilities, and even though no goalkeeper coaching school in history has helped as many young goalkeepers get to professional clubs like J4K has... this testimony proves that J4K cater, really does cater for all!!! I have a nine year old autistic boy who has physical disabilities and has hearing difficulties. When he was three we were told his co-ordination was so poor that he would never write. This meant that he struggled with team sports and his movement was quite clumsy. We started with kick boxing and singing so he had some interests and yes he has learnt to write. a year ago as he was in a small school the kids managed to persuade him to go in goal in an interschool football tournament imagine our surprise when he as quite good. We found Just4keepers and Jim Provitt and he has been fantastic. Having played for less than a year he was offered a spot in three first division tjfa teams. He has picked one and between you and I he has played for four times now they weren’t doing so well but they have drawn once and won three times with him in goal. Yes of course this is a team sport but when he struggled to even go to football parties at aged 6 this is more than we could have ever dreamed of. His fitness is improving, he is managing, sort of with the other kids and can hear most of what the coach says. so football could give our son self confidence, improved fitness and a sense of being part of a team. So Jim Provitt of J4K in billingham has done a fantastic job with him. There might be kids out there who have got into man u or wherever but for disabled kids Just4 keepers have done a brilliant job (unlike the fa).